The proposed Spaceport Colorado would build upon the state's aerospace prowess, home to the nation's second‐largest aerospace industry. The proposed Spaceport Colorado is moving closer to reality, with its supporters seeing it as an ideal hub to support high-speed suborbital flights with intercontinental range. Front Range Airport, striving to be the home of Spaceport Colorado, signed a letter of intent last month with Rocket Crafters Inc. for horizontal launch, dual-propulsion, suborbital flight operations at the general aviation airport. Founded in late 2010, Rocket Crafters Inc. of Titusville, Fla., is focused on development, manufacturing and distribution of rocket propulsion and dual-propulsion (jet/rocket) suborbital flight vehicle products to the commercial markets in the space, space exploration and defense industries. Front Range Airport has 996 acres of developable land adjacent to existing ramps or is master planned to be accessible to ramps and taxiways. A 6,300-acre business park is also planned for development to support airport-related commercial activities and businesses with direct access to highway, rail, and airport services. Front Range Airport is 6 miles (9.6 kilometers) from Denver International Airport, in Watkins, Colo. Upon receipt of a spaceport license from the Federal Aviation Administration, Rocket Crafters intends to locate certain pilot astronaut and mission specialist training activities at the spaceport. An illustration of the Sidereus space plane vehicle design under development by Rocket Crafters. The space plane is a planned suborbital flight vehicle. Rocket Crafters further plans to conduct test flights of its planned Sidereus and Cosmos Mariner suborbital flight vehicles between Spaceport Colorado and the proposed Neil Armstrong International Air & Space Center, in Titusville. Rocket Crafters plans to establish offices and specialized facilities at Spaceport Colorado to support up to 80 full-time jobs. “We are establishing the first commercial spaceflight academy using rocket- powered and suborbital-capable flight training vehicles. We anticipate our 1st class for FAA approved commercial astronaut wings for Pilot and Mission Specialist will begin in 2014", the website reads. Privately funded, the group’s planned dual propulsion — jet- and hybrid rocket-powered trainers — will give civilian pilots stick-n-rudder training in high-performance aircraft and suborbital space planes. Rocket Crafters plans to introduce a primary-level trainer capable of teaching conventional-to-rocket-powered flight transition before the end of this year and begin delivery of new jet/rocket powered aircraft to flight schools and aviation colleges beginning in 2013. “Much of the design/engineering for our advanced sub-orbit capable space plane has been completed,” the group’s website explains. “We anticipate first flight sometime before the end of 2014." Jones said that commercial spaceports will support suborbital flights transporting passengers and high-priority cargo over long distances at six times the speed of current commercial airliners. “They will complement America's highly developed air transportation system by being located on or near major commerce and transportation hubs like Denver,” Jones said. “We applaud the leaders from Front Range Airport, Adams County, and the State of Colorado in taking this bold step and leading the nation in what some call 'the second Golden Age of Flight,'" Jones said. Last month, the Federal Aviation Administration announced nearly $500,000 in matching grants to three projects in California, Colorado and Hawaii that will help develop and expand commercial space transportation infrastructure. The FAA’s Office of Commercial Space Transportation is responsible for licensing, regulating and promoting the commercial space transportation industry. Within those three matching grants, $200,000 was awarded to Colorado’s Front Range Airport Authority. That grant will be used to conduct environmental and other feasibility analyses for a potential FAA Commercial Launch Site Operator’s License. The federal matching grants fund up to 50 percent of the total project cost in conjunction with state and local government funding. In addition, the grants require that a minimum of 10 percent of the total project cost come from private funding, the FAA announcement said. Advocates for Spaceport Colorado are pushing to have the state as a hub of civilian spaceflight activities. The feasibility study is a first step in a process to establish a spaceport in Colorado. In a joint statement issued Sept. 25, U.S. senators Michael Bennet and Mark Udall of Colorado applauded the FAA grant. 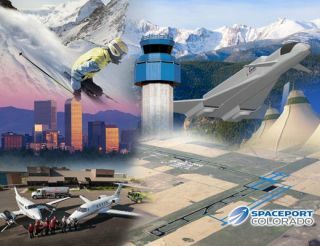 Udall said that Colorado “is an ideal hub for a spaceport” as the state is home to the nation’s second‐largest aerospace industry, a well‐educated work force, and a large technology business sector. “This competitive grant will support Colorado’s advances in the way we travel in space, and will help grow economic opportunities and well‐paying jobs for Coloradans,” he said.